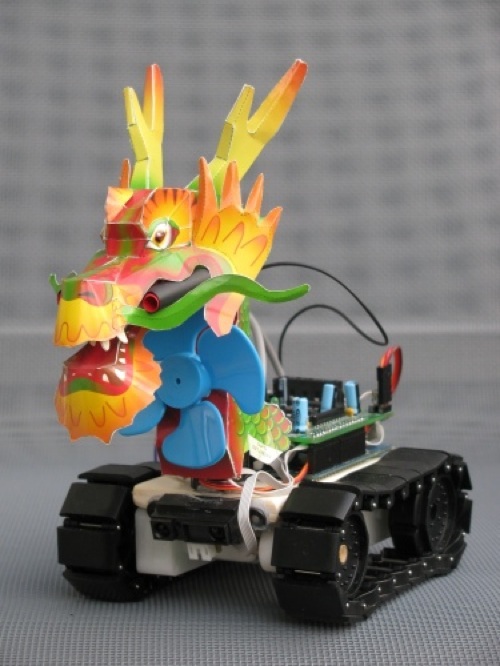 “Puff ” – The magic motorshield dragon « Adafruit Industries – Makers, hackers, artists, designers and engineers! “Puff ” - The Dragon Enters. Puff is able to Put out Fires – He Scans his Head to find the Flames – he orientates towards the Flame – and Blows it out. If he fails to blow out the Fire within 2 sweeps then the “PANIC” mode switches in and he backs away to save himself from frying his “Chips”. 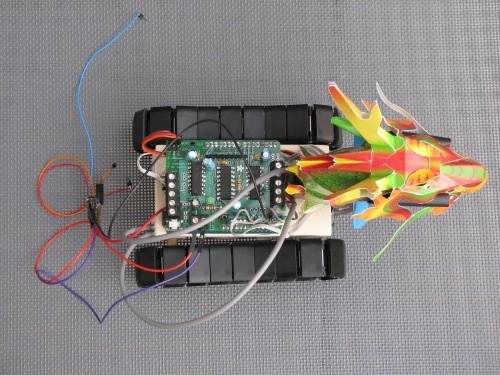 Puff is an Arduino based tracked autonomus Robotic Vehicle with “Cliff” and “Obstacle” detection. “Puff ” and i are over the moon that you have discovered us. I am the creator of the above dragon and it uses:- Adafruit Motor/Stepper/Servo Shield for Arduino kit. “Puff ” will shortly have some pyro-techniques installed – which will consist of Green Flash cotton/paper fired by a arduino controlled “Glow-plug” – this will produce a flame from “Puffs ” mouth – should make a super entrance to the “Show Video” being filmed now. This is an amazing bot. I love the whole dragon theme. I really want to see the programming for this bot. I had a spare motor port on the MotorShied so i used it as a relay driver to fire a Flame-ing dragons Breath. I used a spare Motor port on the Motor Shield to directly drive a 6 Volt Relay that fires the “Pyro ” electronics – this was a pretty neat trick for the shield to do this (meant less electronics to drive relay).